← Who is this bearded man from Abel Beth Maacah? Many interesting discoveries are made by construction workers who are preparing to build a new structure, built a new road, or install new water, sewer or gas lines. It happened this month in Tiberias. Here is a portion of the report from the Israel Antiquities Authority. A fine and complex burial cave dating from the Roman period (c. 2000 years ago) came to light a couple of days ago in Tiberias. The cave was discovered in the course of development works carried out by the Tiberias Municipality for a new neighborhood in the northern part of the town. 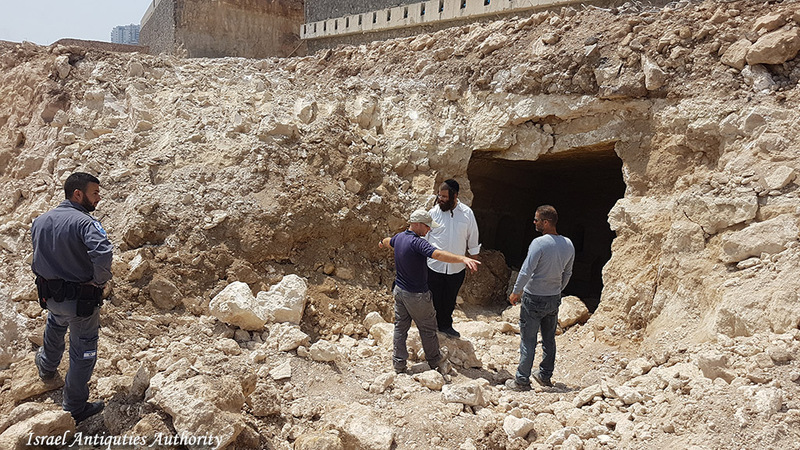 The contractor immediately informed the Israel Antiquities Authority when a mechanical digger exposed the cave entrance, and an antiquities inspector came to the site. The tomb was exposed accidentally during preparation for construction of a housing project. Photo: Miki Peleg, IAA. 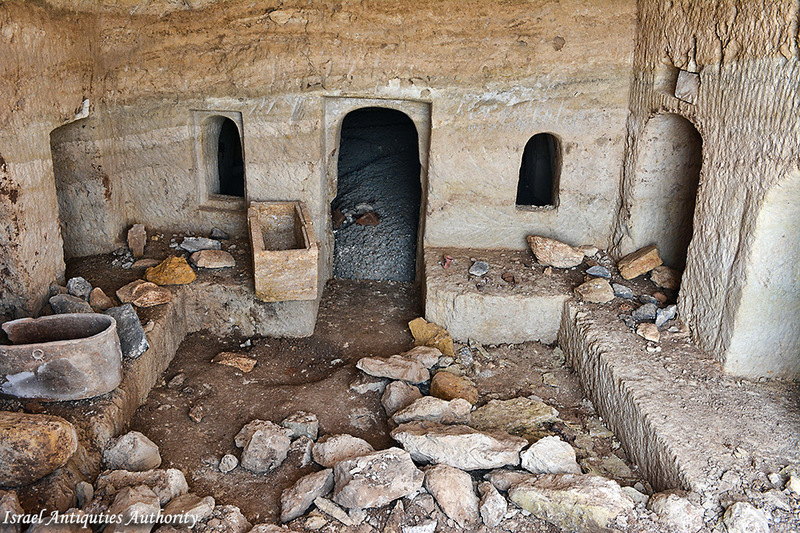 The rock-hewn cave comprised an entrance hall decorated with colored plaster, a central room with several burial niches, decorated ceramic and stone ossuaries, and a small inner chamber. Carved stone doors stood at the entrances into the rooms. In one of the chambers Greek inscriptions were engraved with the names of the interred. These inscriptions will be studied by specialists. The cave was probably robbed in antiquity. According to Yair Amitsur, Antiquities Inspector of Tiberias and Eastern Lower Galilee in the Israel Antiquities Authority, “the cave must have served as a burial complex for a family who lived in the town of Tiberias or in one of the adjacent villages”. This photo provides a wonderful view into the Roman period tomb with burial niches (kokhim) and ossuaries. Photo: Miki Peleg, Israel Antiquities Authority. Two thousand years ago, in 18 CE, Herod Antipas, the son of Herod the Great, and Governor of the Galilee, established the city of Tiberias and named it in honor of the Roman Emperor Tiberius. Over the centuries, Tiberias served as the capital of the Galilee, and was one of the largest cities in the country. The city extended from south of Hamei Tiberias, the hot springs, to the center of the modern town. In the Roman and Byzantine periods, several smaller villages grew up on the outskirts of the city, including Bet Maon, the home of Resh Lakish, Kofra, Beer Meziga and others. The cave must have been owned by a family from Tiberias, or from one of the surrounding villages, who chose to be interred north of Tiberias, overlooking the Lake of Galilee. The cave was blocked up in order to protect it, and it will be researched by experts from the Israel Antiquities Authority. The kokhim-type tombs such as this were typically in use by Jews from the end of the second century B.C. to the fall of Jerusalem in A.D. 70 (McRay, Archaeology and the New Testament, citing V. Tzaferis on p. 204). There may be more recent evidence that would change this understanding, especially in Galilee. This entry was posted in Archaeology, Bible Places, Bible Study, Culture, Israel, New Testament, Photography, Travel. Bookmark the permalink. Reblogged this on Shalom Israel.